The National Academy of Sciences (NAS) has elected Emory immunologist Rafi Ahmed, PhD, to the National Academy of Sciences. Ahmed is director of the Emory Vaccine Center, professor of microbiology and immunology in Emory University School of Medicine and a Georgia Research Alliance Eminent Scholar. 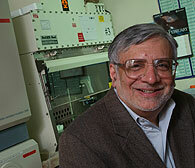 He is associate director of vaccine science for the Emory Center for AIDS Research. The NAS elected 72 new members and 18 foreign associates in recognition of their distinguished and continuing achievements in original research. Election to the NAS is one of the premier recognitions in science. As one of the world’s leading immunologists, Ahmed’s groundbreaking discoveries on immune memory have laid the foundation for understanding vaccine-induced immune responses. His most recent work has focused on rejuvenating the immune response to chronic viral infections. This holds great promise for those infected with HIV/AIDS and other chronic infectious diseases such as hepatitis and tuberculosis, and it also has potential for treatment of cancers. Ahmed joined Emory in 1995 from the University of California, Los Angeles (UCLA) School of Medicine. He has overseen the development of the Emory Vaccine Center into the nation’s pre-eminent academic vaccine center. "When we recruited Rafi Ahmed as a GRA Eminent Scholar, we knew that we were gaining a talented and visionary scientist. What we actually gained was so much more. He has been a key driver in building Georgia's reputation as a leader in vaccine development and global health and has helped to develop what may be the world's first HIV/AIDS vaccine,” says Mike Cassidy, president and CEO, Georgia Research Alliance. "This is a well-deserved recognition of Dr. Ahmed's contributions to microbiology and immunology. His leadership of the Emory Vaccine Center, which is housed at the Yerkes National Primate Research Center, is based on collaboration and a steadfast dedication to scientific discovery. He is a role model for all our researchers working together to address the world's most pressing infectious disease concerns," says Stuart Zola, PhD, Yerkes director. Ahmed’s research articles in scientific journals have been cited as among the leading all-time scientific publications. An article in the journal Nature in February 2006 was ranked as the top immunology paper by the Faculty of 1000 Biology and as the fourth leading paper in all of biology. The article, describing research in Ahmed’s laboratory, was entitled "Restoring function in exhausted CD8 T cells during chronic viral infection." Another article in Nature in August 2006 explained additional discoveries in the Ahmed lab about the molecular pathway called PD-1 (programmed death 1), and a method of blocking PD-1 to restore immune function against chronic infectious diseases. In an August 2007 article in Science, Ahmed described discoveries about the transient immune suppression that occurs during acute infections and that could help scientists devise better dosing schedules for multi-dose vaccines. A Nature article in April 2008 by Ahmed and colleagues described a new, faster way to create human monoclonal antibodies against infectious diseases by tapping the immune system immediately after vaccination. Ahmed has received numerous grants for his research, including a $12.5 million Grand Challenges in Global Health grant in 2005 from the Bill & Melinda Gates Foundation for research on hepatitis C virus infections, a $4.5 million grant from the Gates Foundation in 2006 for HIV vaccine research, and a $13 million grant from the National Institutes of Health in 2008 for work on PD-1. He earned his PhD from Harvard University. After completing postdoctoral training at Scripps Clinic and Research Foundation in La Jolla, Calif., he joined the Department of Microbiology and Immunology at the UCLA School of Medicine. He was at UCLA from 1984-1995 before moving to Emory. The National Academy of Sciences is a private organization of scientists and engineers dedicated to the furtherance of science and its use for the general welfare. It was established in 1863 by a congressional act of incorporation signed by Abraham Lincoln that calls on the academy to act as n official adviser to the federal government, upon request, in any matter of science of technology.